Excerpt from U.S. Coast Guard “Proceedings of the Marine Safety & Security Council” magazine by LT Jarrod DeWitz, Vessel Response Plan team, U.S. Coast Guard Headquarters Office of Vessel Activities. 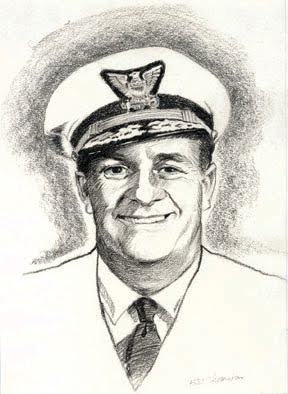 RADM William “Mike” Benkert (see sketch) was considered by many to be the father of the U.S. Coast Guard’s marine safety program. While serving as the office chief of marine environmental systems, RADM Benkert initiated many of the programs we have in the prevention department today. This prestigious award recognizes outstanding achievements that extend far beyond mere compliance with industrial and regulatory standards. More than just a symbol of excellence, the award provides an avenue for creative exchanges of ideas and innovations that benefit both the industry and the public. The U.S. Coast Guard is proud to partner with the American Petroleum Institute (API) in this program. The API has hosted the Benkert Award presentations during the last several award ceremonies and plans to continue its support of this award. API also provides senior event staff to assist with coordinating the Benkert Award presentations during its bi-annual tanker conference. Although this event was originally geared toward the tanker community, it has expanded to include many important topics that cross all of the maritime industry. Any marine transportation-related commercial organization owning, operating, or otherwise managing vessels, facilities, or fleeting areas; oil spill removal organizations; or other entities engaged in maritime operations are eligible to apply. The award program has three levels of recognition—gold, silver, and bronze. If an organization exceeds all review criteria expectations, then an “Osprey” is awarded as the top prize. The program is capable of recognizing multiple recipients at any or all of these levels. The application submission deadline is February 1 every “even” year. The selection process concludes April 1, and the informal notification is expected in May of the award year. Award presentations are held in June. For more information, go to http://homeport.uscg.mil/benkert.